It's a New Year guys! And you know what that means, a new year to be a new you. If you follow me on Instagram then you know that I have been on the workout/healthy eating train and it is going in full force. I love feeling good and working out is the best thing that you can do for your body. One thing that always gets me motivated to workout is cute workout gear and Walmart has the best selection to help you kick off your new (or continued) healthy habits. One thing I love about Walmart are their prices. 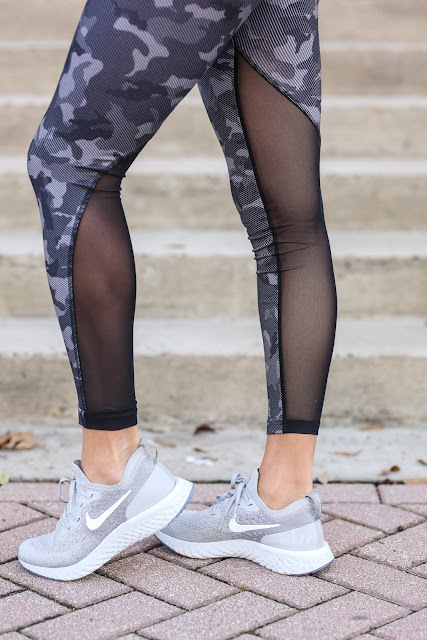 When I went on the website looking for new workout clothes I could not believe how affordable everything was and even more how CUTE and trendy all of the workout clothes were. When I received the clothes in the mail I was blown away by the quality. They seriously have the best apparel and accessories that you need to look, feel, and perform your best when you are working out whether it be at the gym, a class, or even in your own home. These camo leggings that I got from Walmart are seriously my new obsession. They are not only so cute but they are so comfortable to wear. They aren't too tight and aren't too lose; just the perfect fit. I love the camo print and also love the sheer design on the back of the legs. I have worn them to the gym multiple times now and they are a new favorite of mine. I am wearing a size small for reference and I am a normal size 2. I also love this sports bra crop top that I got. This one is made by Bally Total Fitness and I knew I would love it because I already have 2 from that brand that I wear all the time. This is probably the most comfortable sports bra that I own. It comes completely padded and has great support. Plus, this color will go with any pair of leggings. I am wearing the size medium. Since it is cold right now I decided to also grab a new workout jacket. I also was very happy about the quality of this one. I own a few Lululemon jackets that I spent an arm and a leg on and none of them keep me as warm as this jacket. Plus, it also has a hood, pockets, and thumb holes to keep your hands warm. I find myself wearing this pretty much every single morning to the gym. It also comes in multiple colors if you want to be a little more fun than me and get something other than black! I seriously can't recommend Walmart's activewear clothing enough and you can check out their entire collection at the link here. If you are looking for cute workout clothes but don't want to spend a fortune, this is hands down the best place to shop. I wish you all good luck with your healthy New Year's resolutions. I know you can do it! We are all in this together. And there is no better feeling than living a healthy, active lifestyle.